Children need to express themselves through creative outlets like drawing, singing and playing pretend to stimulate brain development. We’re not talking baby modern art prodigies here — simple games and activities can inspire curiosity in young minds. Being creative encourages kids to take risks and cultivate their personality which helps them feel more confident as they grow. Set them on the path for success young with these tips to spark creativity. 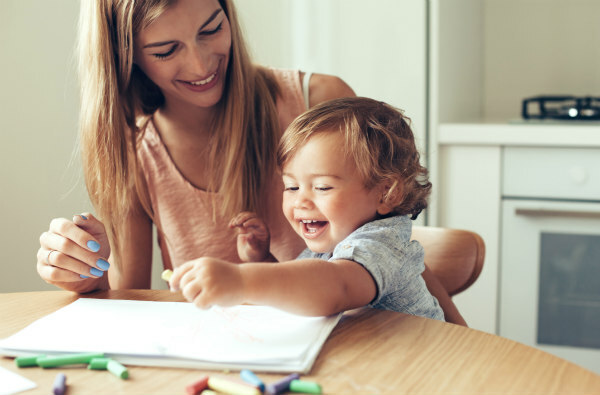 From birth to twelve months, your child will be creating millions of neural connections each day and you can promote this growth by engaging in fun activities. Encourage your child to explore your face. Name the different parts of your face as he touches them to help him learn. Your child may not be walking or talking yet, but with your help, they can definitely boogie so turn on some music. Between 12 months and three years old, children start use tools around them to engage with their world. Writing starts with scribbling! Encourage your child to draw with crayons or even with sticks in the sand. Check out this video to learn why it’s important. Collect a variety of lids, plates, or boxes of different shapes. Sit at the table with your child on your lap, and show him how to trace one of the objects with his finger. Then, give him a crayon or pencil to trace around the object onto a piece of paper. Playing dress up lets your child make decisions and have fun. This activity will build your child’s self-esteem as you accept and encourage her choices. Teach your child the names of body parts in both Spanish and English with this fun song. Children learn about themselves and the world through open-ended play – play that doesn’t have rules or adult reasons. One way to support this is to have a box of random objects available for your child to use. You can make a trip to the thrift store, trade materials with another family, save wrapping paper and bows, collect rocks and leaves from the outdoors – the options are endless. Tape a large piece of paper to the table and let your child draw with a crayon while you talk to him about what he creates. Even imitate what he draws–if he draws a red curving line, do the same. Imagination and creativity are a huge part of your child’s preschool years. Expect your child to tell stories and sing songs as a means to communicate and navigate the world. This video clues you in on all the exciting milestones they’ll be reaching. You can do many things to encourage a child’s natural creative spirit. Support their curiosity: if a child asks a question and you don’t know the answer (or even if you do), ask the child what they think the answer might be and why; then find out together. Help frame “mistakes” as “opportunities to learn.” A child will have much more resilience in school if they know that they will sometimes make mistakes along the way as part of learning.